Predictably, the proponents of Proposition 8 appealed the District Court’s historic decision that struck down Prop. 8, vowing to continue their fight to deny gay and lesbian Californians not only equality, but justice. 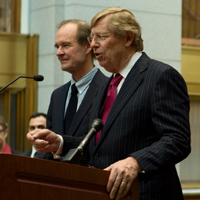 A three-judge panel of the United States Court of Appeals for the Ninth Circuit heard oral arguments on December 6, 2010. As they did during the District Court trial, Theodore B. Olson and David Boies argued that there is no legitimate government interest advanced by denying gay and lesbian Americans their fundamental freedom to marry. Oral arguments were broadcast live on television and the Internet, and were viewed by more people than any other appellate court proceeding in American history.